Cardholders can take advantage of a point-based reward system. Redeem points for savings on Gander Mountain merchandise. Earn 3 points per dollar on each Gander Mountain purchase. New cardholder's will receive a $60 rewards certificate after spending $500 on their new card, as long as one purchase is made outside of Gander Mountain. 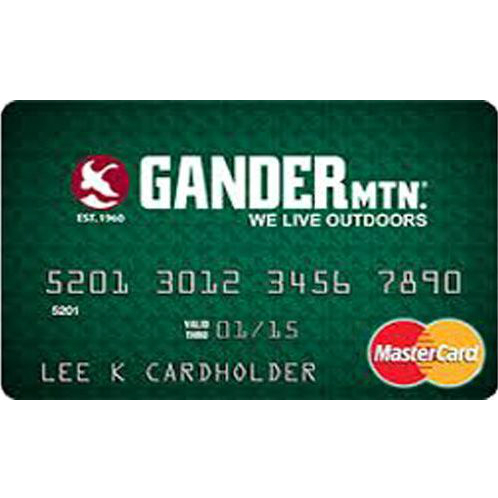 There is no annual fee associated with the Gander Mountain Credit Card. Cash Advance APR of 24.99%. APR of 24.99%, 20.99%, and 16.99% based on Prime Rate and credit rating.